Looking for a simple yet classic homemade fruit smoothie recipe? This easy strawberry banana fruit smoothie recipe is a complete staple for me. 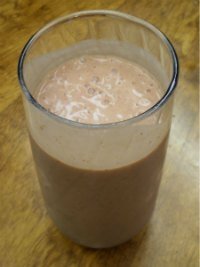 For awhile, it was my favorite smoothie recipe and the one I had made the most times in a row (recently replaced by my new healthy breakfast protein smoothie). This homemade smoothie recipe is perfect for anyone who is just getting started making smoothies at home, especially if you have limited equipment. All you need is the basics...basic ingredients, basic blender, nothing fancy or special. 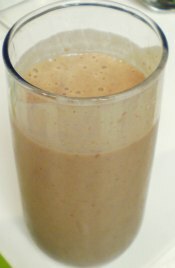 In fact, I think the smoothie’s simple classic flavor is what appeals to me...and the fact that it is so easy to make! But before I divulge the recipe, how did I come up with this smoothie recipe? The truth is, I know this homemade fruit smoothie recipe a little too well. This past year, I lived in an apartment in Spain, where I made this smoothie pretty much every single day for over 3 months. It was my first time living alone in an apartment. At first I experimented with different combinations of fruits in my homemade fruit smoothies, like kiwis, oranges, mango, etc. I knew HOW to make all these different smoothie combinations, but I was on a tight budget and tired of fruit getting spoiled. Plus I had a super busy life and was constantly running around. I just didn’t feel like experimenting very much. 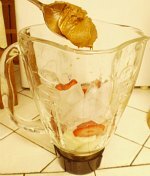 So I ended up getting into a rhythm, making this strawberry banana homemade fruit smoothie almost every day. It became my thing, like peanut butter and jelly, which you can practically make with your eyes closed, in 5 minutes flat. I drank it as my post-workout recovery shake after all my long runs through the Spanish countryside. And it did some good, too. It helped me train to run a half marathon in under 2 hours! 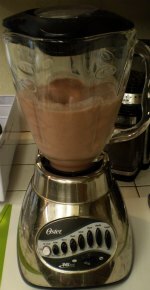 I looked forward to this smoothie every day, especially the chocolate flavor, as a refreshing treat. As an added bonus, I didn’t feel the need to eat ice cream or dessert after indulging on this delicious smoothie. Needless to say, this smoothie recipe is close to my heart, and I’m happy to share it with you. I don’t recommend that you make it every single day…take a look at the other smoothie recipes on this site to add some variety to your life, like this lime smoothie or this mango smoothie recipe. But maybe you’ll find the same comfort and immediate refreshment in this smoothie that I did, or at least learn how to make a really easy smoothie recipe you can have any time of year. The final product! It was hard to take a photo before sneaking some sips. One way you can make this easy homemade fruit smoothie recipe even easier is use frozen fruit! 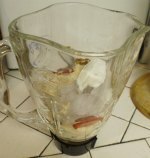 While living in Spain, I didn’t have an ice machine built in to my freezer, and the ice cubes from the frozen trays were too thick for my weak blender. I found that frozen banana did the job better than ice, because it blended more easily and created a creamy consistency. So every time I bought bananas, I took at least one or two, peeled them and threw them in a giant Ziploc freezer bag. 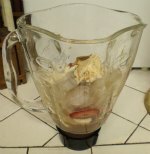 Then, when it was time to make a smoothie, I would take out 1 or 2 (I used canary bananas which were small), cut into small chunks and toss into my smoothie. I didn't need to use ice when I used frozen bananas. Definitely peel the banana before freezing it. You can either break it into small pieces before freezing it, or cut it with a good knife after it’s already frozen. You can also freeze strawberries by cutting off the stem first and throw them in whole. I didn’t do this often, because I prefer the taste of fresh strawberries when they’re available. You can even buy a big bag of frozen strawberries from Costco! How convenient, right? Try these variations or invent your own for endless possibilities of strawberry banana smoothie recipes! Use just one fruit (strawberry OR banana) to make an even simpler, easier smoothie that's still tasty! Add in flaxseed or chia seed to increase the nutrients in your smoothie...make it a superfood smoothie! 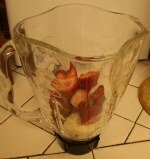 Liked this easy strawberry banana smoothie recipe? Take it to the next level with this delicious green strawberry banana smoothie recipe. 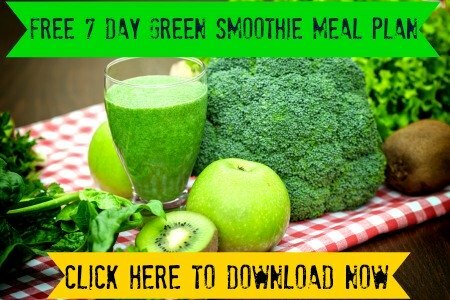 Want to know what makes this smoothie so healthy? Learn more about banana nutrition benefits.